Former U.N. Ambassador John Bolton said on Monday that “staff changes at the White House” have made it impossible for him to see President Donald Trump to present his plan for withdrawing from the Iran nuclear deal. Bolton published his five-page plan in its entirety at National Review, offering it as what he described as a “public service,” because he can no longer secure a meeting with the president. “Although he was once kind enough to tell me ‘come in and see me anytime,’ those days are now over,” Bolton lamented. According to Bolton’s introduction, he was asked by former White House strategist and Breitbart News Executive Editor Stephen K. Bannon to draw up a “game plan” for exiting from the Iran deal in late July. Bannon made this request because President Trump was unable to obtain such a game plan from his advisers, despite repeatedly stating that he wanted one. Bolton states that producing a plan to “exit Obama’s failed nuclear deal” was “quite easy,” and wonders exactly who is in control of Iran policy in the Trump White House since he and Bannon can’t seem to get a paper President Trump desperately wants to read onto his desk. “If the president is never to see this option, so be it. But let it never be said that the option didn’t exist,” he writes. Bolton hammers “the JCPOA’s vague and ambiguous wording; its manifest imbalance in Iran’s direction; Iran’s significant violations; and its continued, indeed, increasingly, unacceptable conduct at the strategic level internationally” to argue that the deal is not in America’s interests, but acknowledges that withdrawal must be done carefully to satisfy the terms laid out in the document. Among the steps he advises taking are declassifying U.S. intelligence that would highlight “Iran’s unacceptable behavior around the world,” convincing the international community that the deal is a liability to their security interests as well, and outlining the worst mistakes made by the Obama administration when the deal was negotiated—mistakes so serious that, as Bolton points out, Obama was afraid to properly submit his deal for ratification to the Senate as a treaty. Bolton recommends looping North Korea into the discussion by outlining its ties to Iran. He advises a “greatly expanded diplomatic campaign” in Europe and the Middle East following Trump’s announcement that the JCPOA is null and void, which sounds like it would include abundant reminders to Middle Eastern nations that Iran is their active and determined enemy. A white paper of unassailable thoroughness and integrity would also be prepared to justify American withdrawal from the JCPOA. 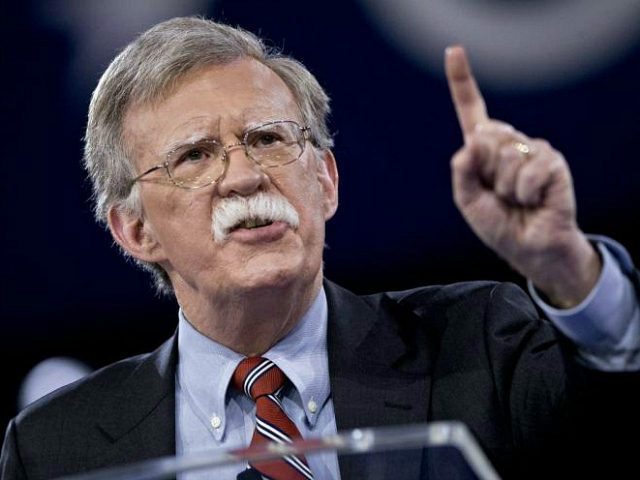 Bolton recommends thoroughly documenting the shadowy activities of Iran’s Revolutionary Guard and exposing the seedy “underbelly” of its business activities, especially its ties to North Korea. That would make for a very thick white paper because the Revolutionary Guard is up to a great deal of no good. One can see why Bolton compares expanding his five-page outline into 100 pages or more to brewing a cup of instant coffee. The Bolton plan emphasizes rebuilding the “counter-proliferation coalition” that was “squandered by the previous Administration,” by getting the old band of European and Persian Gulf allies plus Israel back together for another round of sanctions on Iran. Bolton recommends making a courtesy call to Russia and China, but clearly does not expect them to be on board. This could leave the counter-proliferation coalition in the same position it holds with respect to North Korea, where tough sanctions are easily circumvented by a few powerful patrons of an outlaw nation, although Russia and China might be hard-pressed to replace what Iran would lose from new U.S. and European sanctions. Among the screws Bolton recommends putting to Iran are ending U.S. visas, denying Iranian aircraft and ships landing and docking rights, supporting the democratic opposition to the theocracy, and announcing American support for Kurdish nationalists, as well as other oppressed minority groups in Iran. Supporting the Kurds would keep Turkey from signing on to Bolton’s plan, but since U.S. troops were just obliged to exchange fire with Turkish-supported rebels in Syria, keeping Turkey happy is growing more difficult anyway. Taken in sum, Bolton’s recommendations would shake up the entire diplomatic order created by the previous administration, decisively ending Obama’s bizarre pivot to Iran and drawing some very solid lines in the Middle East. That probably won’t sit well with Obama holdovers in the Trump administration. Unfortunately, the opinion of Obama holdovers appears to matter far more than President Trump’s voters expected.